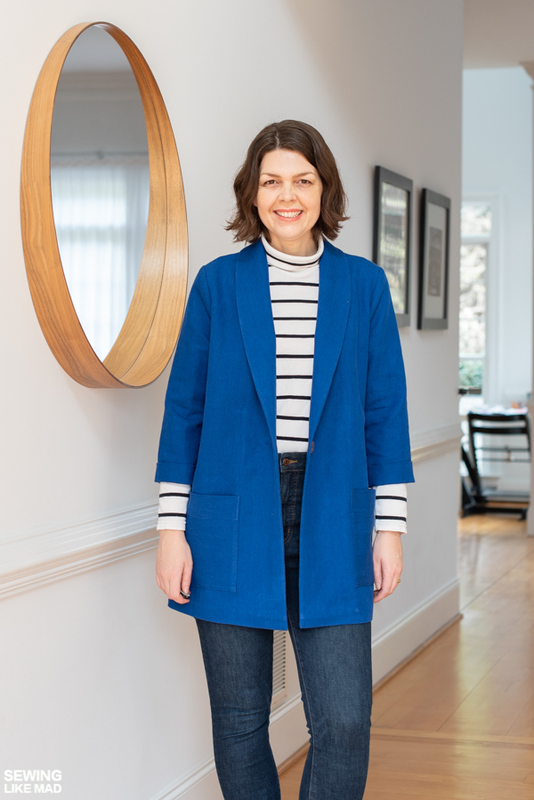 Sewing Like Mad: Loren Woven Jacket by Style ARC and Pivot Tutorial. This is a size 10. 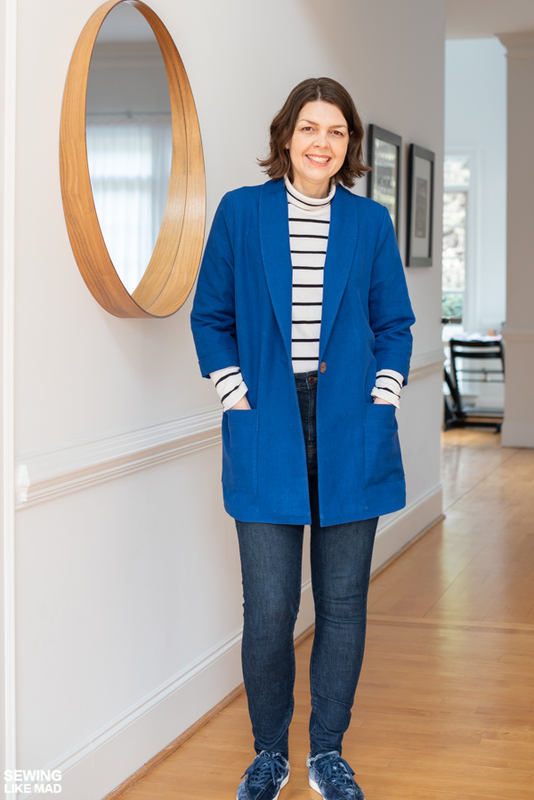 Which is my regular Style ARC size for jackets, cardigans and loose dresses (there are exceptions, but this is generally speaking). I did no changes at all to the pattern. Normally I would add length to my sleeves because of my height (178cm/ 5'10") but because of the 3/4 sleeve, I wasn't worried. I love the length I ended up with. The fabric, oh the fabric. It's a medium weight 55% linen and 45% cotton blend. It is a gift from my sweet friend Emi and when I first received it, besides being overwhelmed by the generosity, I didn't immediately know what to make with it. NOT the same as not being happy for it. I knew I would figure it out at some point, I just didn't know right away. I'm so glad I saved it for this project because it couldn't be more perfect. You can't see it in my photos but it has this amazing wide striped herringbone texture. Miss Matatabi is sold out of the blue color but the listing is still up. See it HERE. If you search 'Kokka + herringbone' on her shop website, other colors come up but they are close to being sold out too. I cut my 'stripes' vertical on the jacket itself and horizontal on the pockets, just for interest. 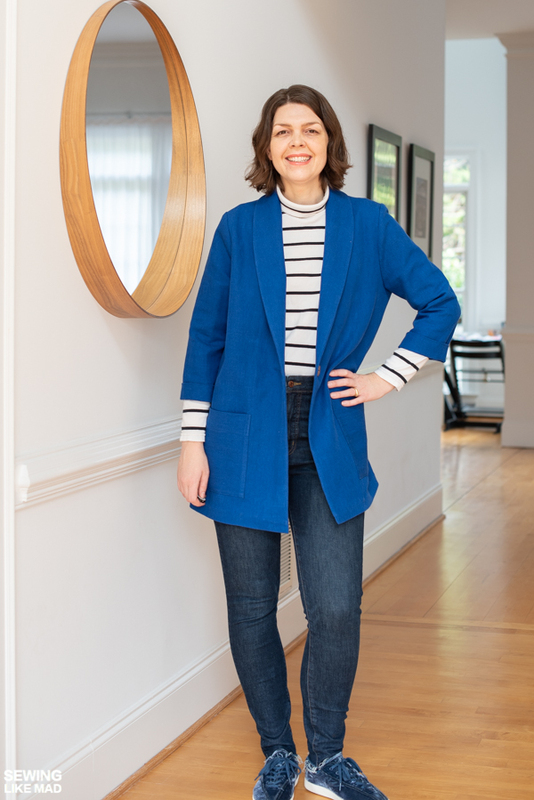 After I finished sewing this jacket (in record time), I realized that this jacket is the perfect 'first blazer'. 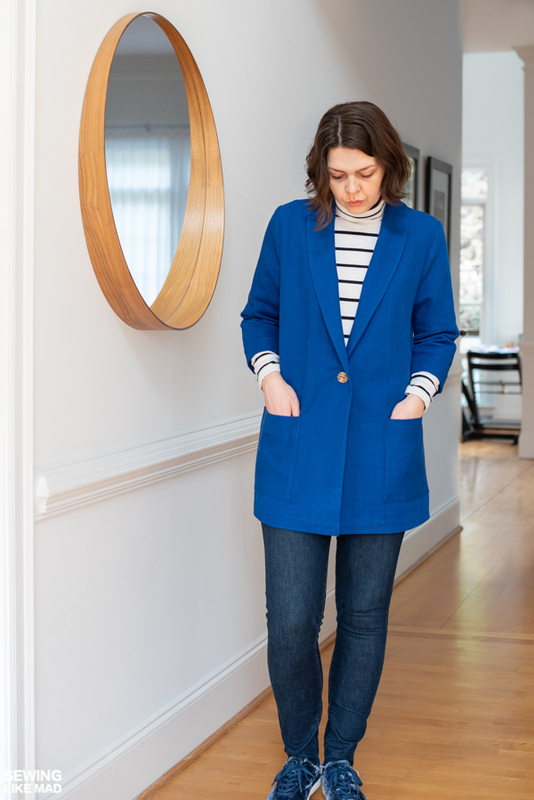 A way to dip your toes into blazer sewing, so to speak. 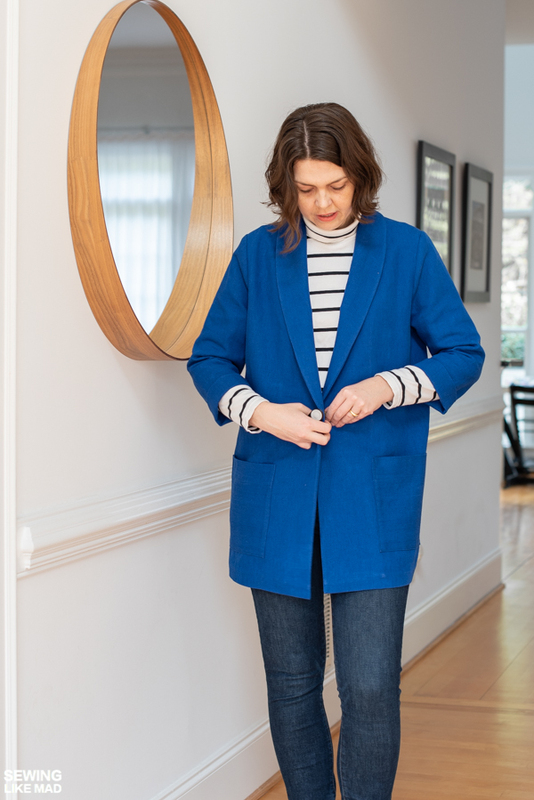 There is no lining, it has a shawl collar which is much easier than lapels, and it has patch pockets which is much easier to sew than welt pockets. You don't even need to make a buttonhole, although of course you can put a button in like I did. I don't know if Style ARC deliberately designed it with the easiest techniques (and I mean easier, not bad techniques!) but it's a stroke of genius. 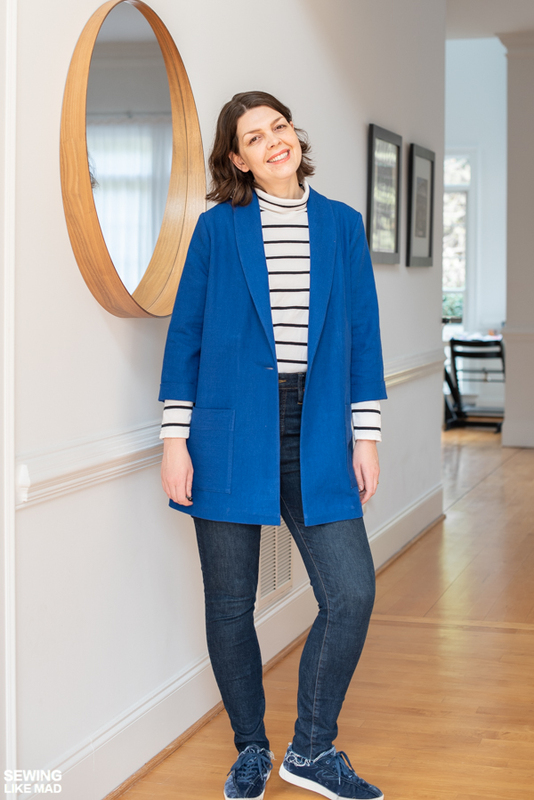 On top of that, the style is designed to be more relaxed (versus structured) and you can get away with using a minimum of interfacing (depending on fabric of course). I only have interfacing on my front facing and my bottom hem on this one. But the number one thing when sewing blazers is still PRESSING. For the love of.... press your seams and hems and collars etc. No matter what techniques and details your blazer has, press it! Here is a #miessewingtips for pressing the front seam of a blazer/coat. This pattern is crazy versatile too. 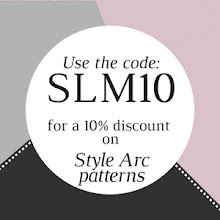 Did you see Style ARC's four versions? (See them in the listing). From cosy sherpa to fancy brocade, all made with this pattern but with such different looks. I love it. My main reason for adding a button was because the button and buttonhole would keep the front facing in place, ha. Of course some hand sewn blind stitches could have done that job too. Or even just leaving it 'loose'. I did hand sew my bottom hem. It was done in an evening in the sofa in front of the tv. Not bad at all. I also decided to treat my outer edges of the front facing and bottom hem with some homemade bias tape (see my tutorial for my no pre-pressing way of doing that HERE), so of course this photo/pose had to happen, haha. Being able to pivot is a skill you'll use again and again. 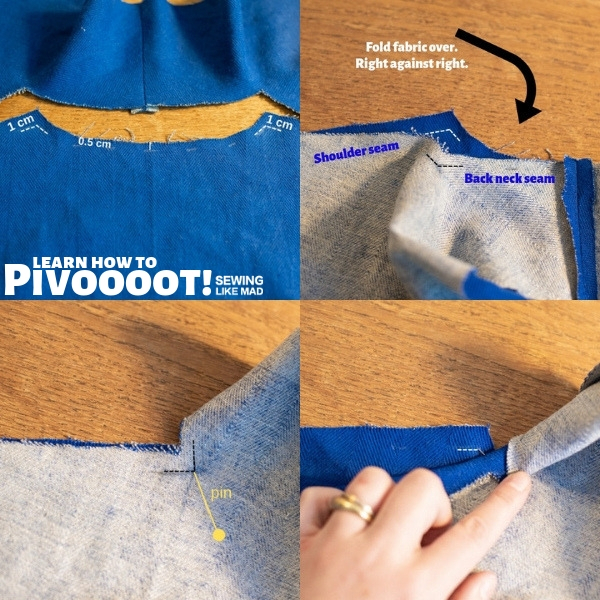 In this pattern you also need to pivot when sewing the shoulder and back neckline in one continuous seam. Here is the way I was taught and which I definitely think is the one with the highest chance of a great result. 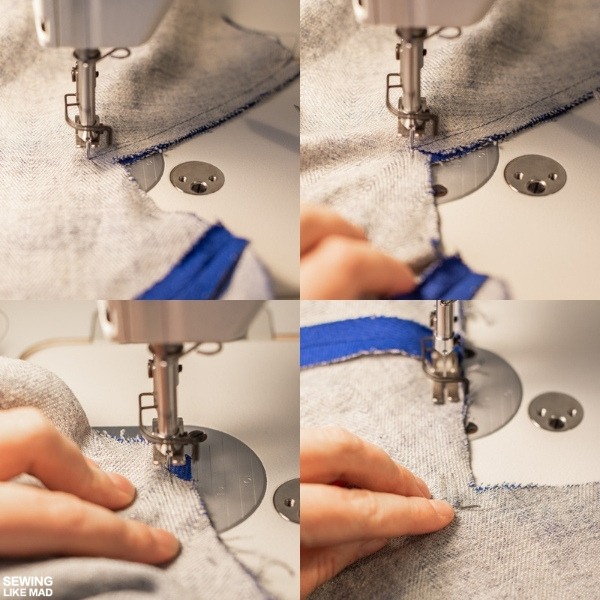 It doesn't mean it doesn't take practice but you got a lot of control when doing it this way, and that is always a good thing when sewing. A few things I want to mention before we start. I don't pre-clip the corner and I sew with the layer that needs clipping at the top. Code word: control. 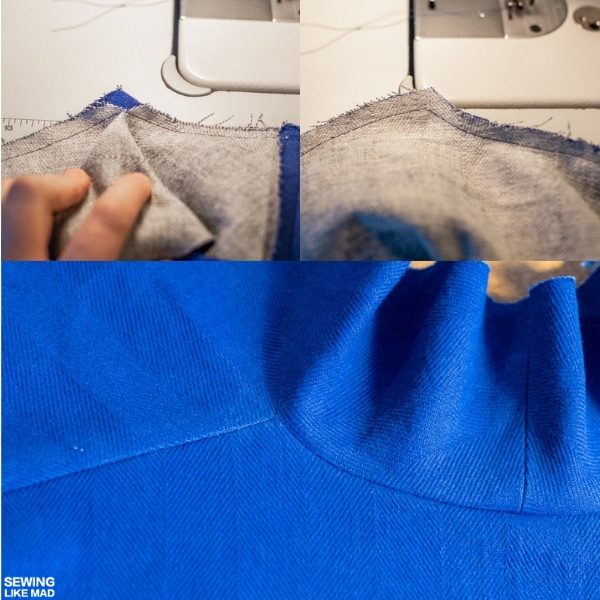 Top, left: First thing is to determine the seam allowances (SA) at the seams where you are going to pivot. 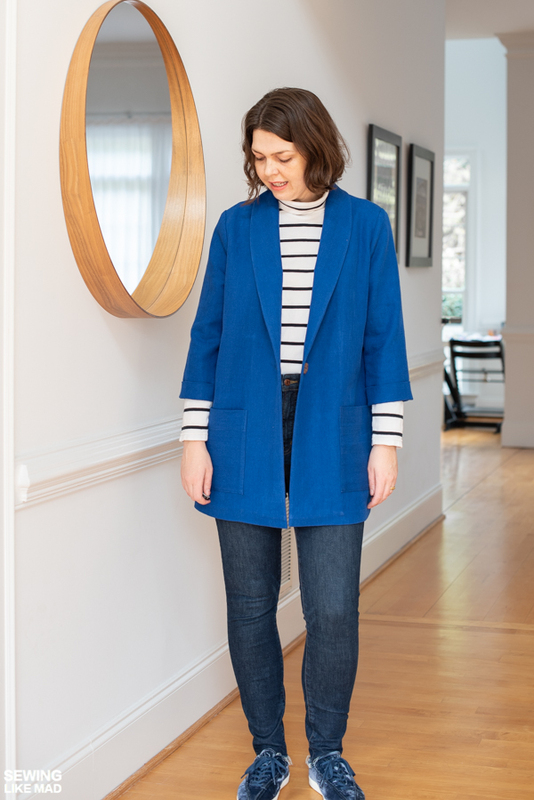 In the case of the Loren Woven Jacket, it's actually a tad (but only a tad) more tricky because the shoulder seam has 1 cm SA and the back neck seam has 0.5 cm. The general technique is exactly the same though regardless of SA. The two seams you are seeing in this photo, are the two that we are going to sew together. 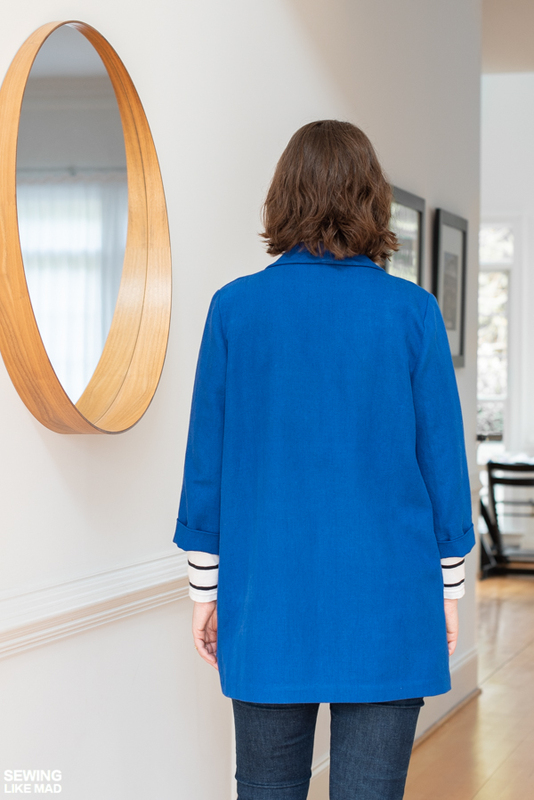 Shoulder seams and neckline in one go. I don't normally do this but it's very helpful to mark the actual SA because you need to know EXACTLY where the corners (where you are going to pivot) are. Top, right: In this photo the front piece (upside down in the first photo) has been flipped on top of the back piece, right against right, so the seams we are going to sew together are aligned. Bottom, right: Now lift the top layer of fabric (with the pin through it) and continue the pin EXACTLY through the corner where the two SA meet on the bottom layer. Top, left: This is how the back side will look if you turned it around with the pointy end of the pin sticking through. This is just FYI. You don't need to turn your fabric around. Top, right: Now start sewing your shoulder seam. Here with 1 cm SA. Bottom, left: I stop sewing and take my foot off the pedal when I'm a couple of stitches from the corner where I'm going to pivot. Bottom, right: Then I start hand wheeling until my sewing needle is just about to hit my pin, which is placed exactly in the corner where I'm going to pivot. Only at this point (look at the photo) do I pull out my pin from the fabric. As soon as you pull your pin, you hand wheel the sewing needle all the way down in the 'hole' that the pin has left. Top, left: My pin is out and my sewing needle is now placed DOWN in the corner of the SA of both layers of fabric. 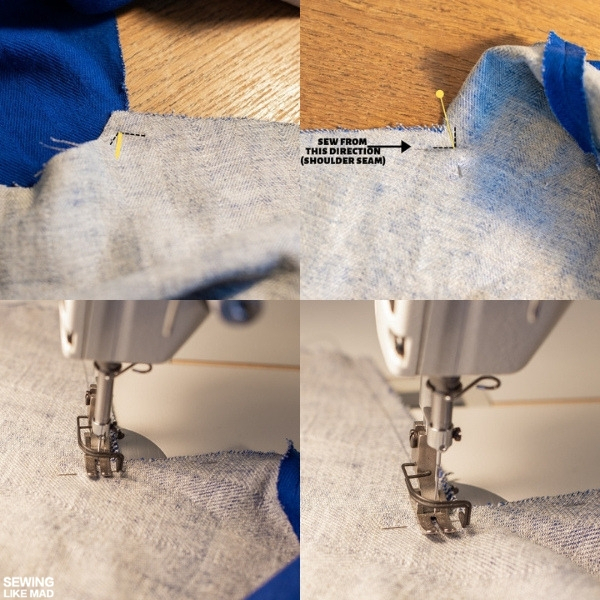 Lift your sewing machine foot and gently move your fabric sideways, still with the sewing needle down in the corner. Top, right: And now you can finally clip that corner. Cut until about 1 mm from the sewing needle. Bottom, left: And pivooooot! With the sewing needle still down in the fabric, you turn the fabric, so you can now sew the neckline. The top fabric, that has been clipped, needs gentle arranging, so it moves over and aligns with the bottom layer neckline seam. Bottom, right: ...When you have crossed the CB with a couple of stitches, you do the exact same thing as you did at the first corner. 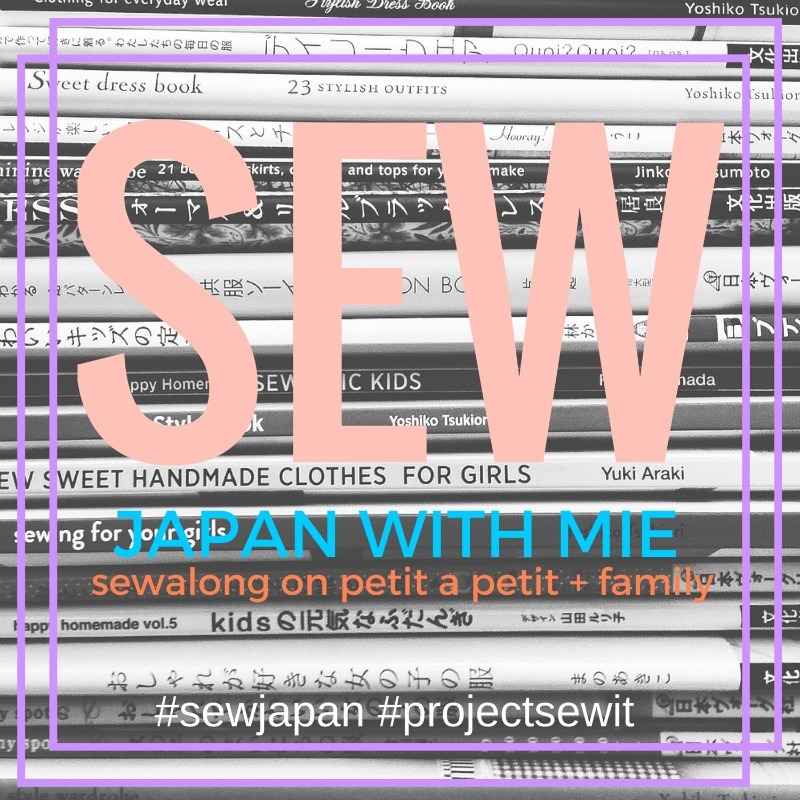 Place your pin in the exact SA corners of both layers and keep sewing, hand wheeling, pivoting and then you finish sewing your second shoulder seam and you are done! Top, left: Result seen from the front. Top, right: Result seen from the back. Bottom: Enjoy your great result after a gentle pressing. Seam forward of course! The reason why I'm sewing with the fabric layer that needs clipping at the top is of course because I can SEE what is going on but also because I need access to the layer that needs clipping, to actually do the clipping. And the reason why I'm not pre-clipping is because it's so easy to accidentally cut it a bit too deep and suddenly the seams don't match up. It literally only takes a millimeter to mess it up. Phew, I think this post is long enough now! 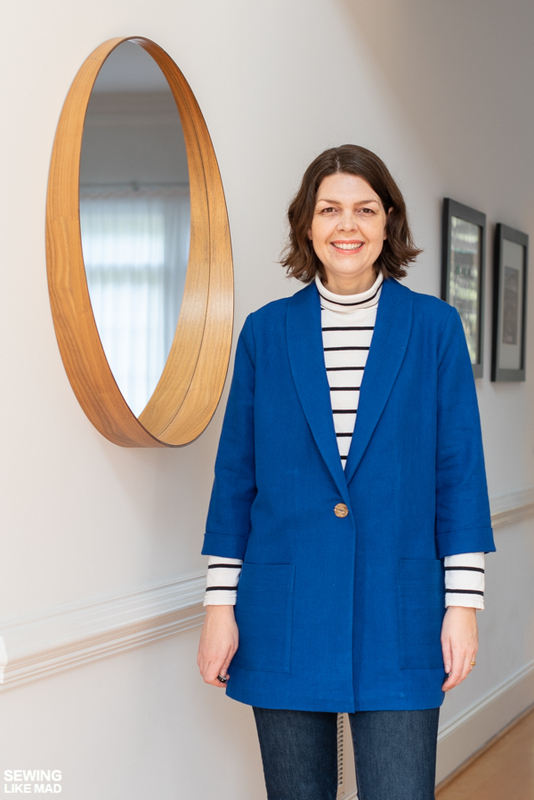 Get your own Loren Woven Jacket HERE. I link to the pdf version because that's my own personal favorite way to buy patterns but it comes as a paper pattern too. Both pdf and paper versions now also have single or multi size options. Also did you know that you now also automatically get a copy shop version together with your pdf purchase. Love this jacket! And your sewing tip- thanks! 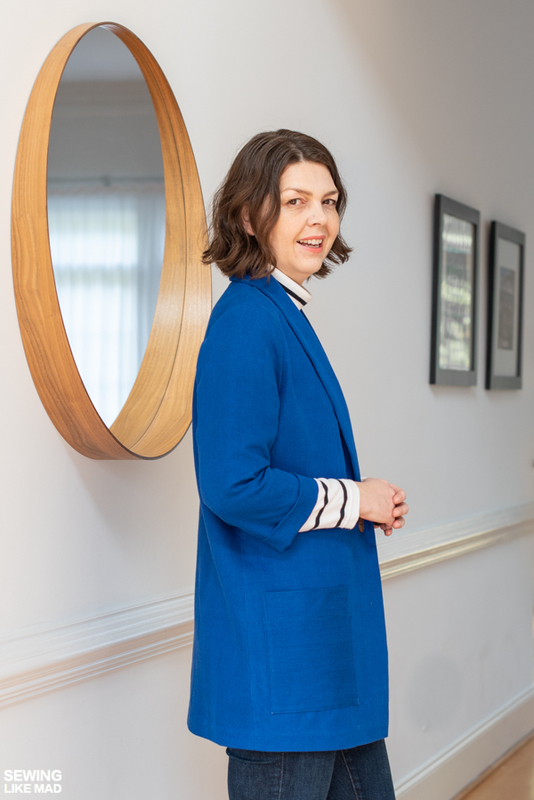 I've been wanting a simple unlined blazer pattern for a long time and I love Style Arc patterns so this one is perfect. Your jacket is perfect, too. Thank you for the tutorial it will be really useful. 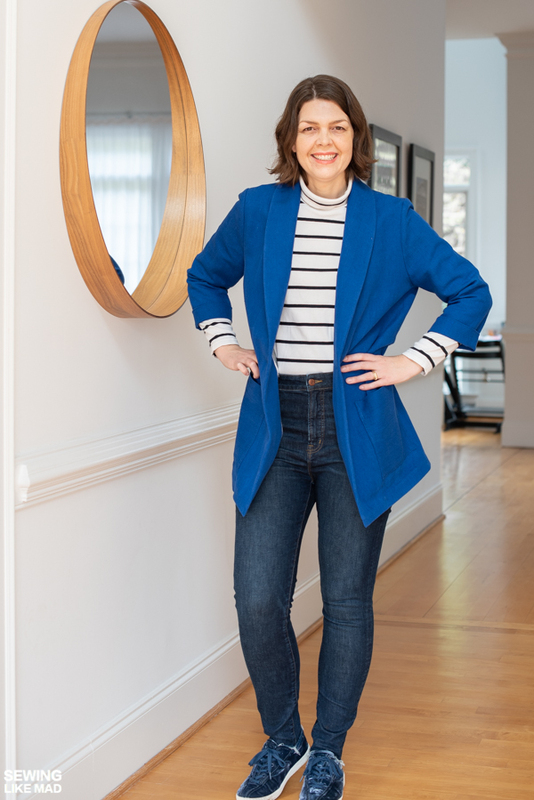 What a lovely jacket and it looks great on you. Well done with the making and may you have lots of enjoyment wearing it. Great tutorial! Just a question re your bias tutorial you linked to... do you ever grade and or notch when doing your bias edges? So I'm not 100% sure I understand your question but I'll answer what I think I understand what you are asking but feel free to let me know, if that's not it, ha. Do I grade my seams when doing bias edges? If I was working with thicker fabric I would. In this case the shirting I used for the bias tape was very thin and the blue fabric is not that thick and with a good press they were nice and flat. All fabrics in the tutorial were thin fabrics too and in my opinion didn't needed them. But by all means feel free to do that. :-) I hope I'm answering your question? Thank you for stopping by. As with all of your tutorials, the photos included with your instructions are so helpful (especially for someone who is a visual learner). I have always found pivoting to be really intimidating and have never had much luck doing it. Maybe because I was clipping first? Or maybe it's just my impatient nature, haha. Anyway, I will be trying this out when it comes time to make my jacket! Thanks for another great tutorial! Thanks so much for this wonderful tutorial. This might be obvious but did you put the bias binding on before you sewed the pattern pieces together or after? Good Question (and I'm SO sorry that it has taken me so long to answer it). The answer is both. I sewed the bias tape on when I had the whole facing ready. And I sewed the bias tape on the hem when the side seams were sewn and pressed. So there are two operations with the bias tape. And then connecting the facing with the hem etc afterwards. I hope this makes sense?! 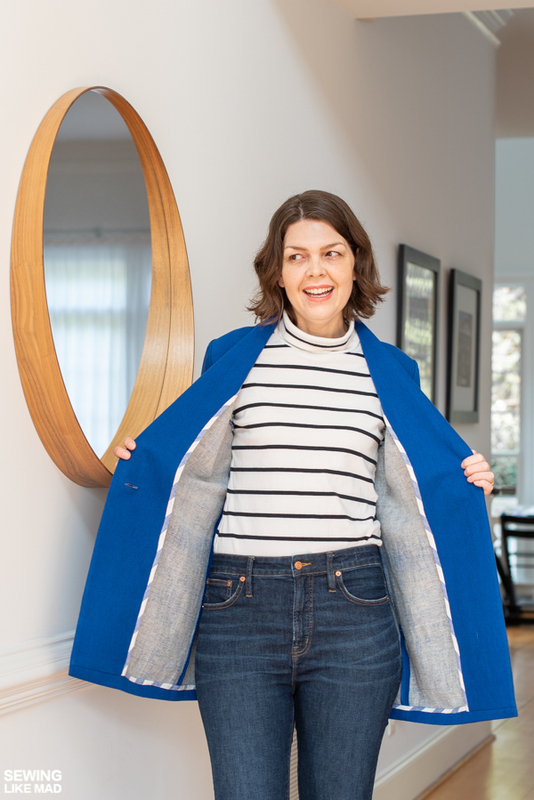 Just made this jacket and used your tutorial. It was really helpful. Thank you. So happy to hear that. And again, I'm sorry I missed your question above. Looks like you figured it out anyway!